This issue’s cover illustration is from A Year of Nature Poems by Joseph Coelho illustrated by Kelly Louise Judd. Thanks to Wide Eyed Editions for their help with this January cover. By clicking here you can view, print or download the fully artworked Digital Edition of BfK 234 January 2019. Here’s a cleverly conceived book that can be read from either end. If you’re feeling a bit sad, there’s nothing like a hug to lift your spirits and so it is for Hedgehog. Tortoise too, is feeling thoroughly down in the dumps and in desperate need of a hug. They both politely ask for a hug from each of the animals they encounter but Fox, Squirrel and Magpie have better things to do than hug prickly Hedgehog although Owl does offer some wise words of encouragement. Similarly, Tortoise is rebuffed by Badger, Rabbit and Frog; but once again Owl endeavours to help with an explanation and encouragement, “But don’t worry, there’s someone for everyone” he tells them both. And then HURRAH! 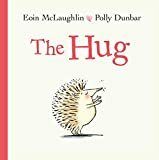 A timely meeting occurs and both prickly Hedgehog and hard-shelled Tortoise discover the perfect hugging partner. Two perfect conclusions, slap bang in the middle of this enchanting picture book, which is a debut for the author. The blank space Polly Dunbar leaves around each of the animals creates the perfect stage for the actors whose expressions and body language, as well as their verbal responses, thus become all the more impactful; and what brilliant characterisation. A smashing story time tale, but also after an initial read aloud, a great book for learner readers.